The tutorial shows how to compare text strings in Excel for case-insensitive and exact match. You will learn a number of formulas to compare two cells by their values, string length, or the number of occurrences of a specific character, as well as how to compare multiple cells. When using Excel for data analysis, accuracy is the most vital concern. Incorrect information leads to missed deadlines, misjudged trends, wrong decisions and lost revenues. While Excel formulas are always perfectly true, their results may be wrong because some flawed data penetrated into the system. In this case, the only remedy is to check data for accuracy. It's no big deal to compare two cells manually, but it's next to impossible to spot the differences between hundreds and thousands of text strings. This tutorial will teach you how to automate the tedious and error-prone task of cell comparison and what formulas are best to use in each particular case. There are two different ways to compare strings in Excel depending on whether you seek case-sensitive or case-insensitive comparison. Where A1 and B1 are the cells you are comparing. The result of the formula are Boolean values TRUE and FALSE. Where text1 and text2 are the two cells you are comparing. As the result, you get TRUE for text strings match exactly including the case of each character, FALSE otherwise. 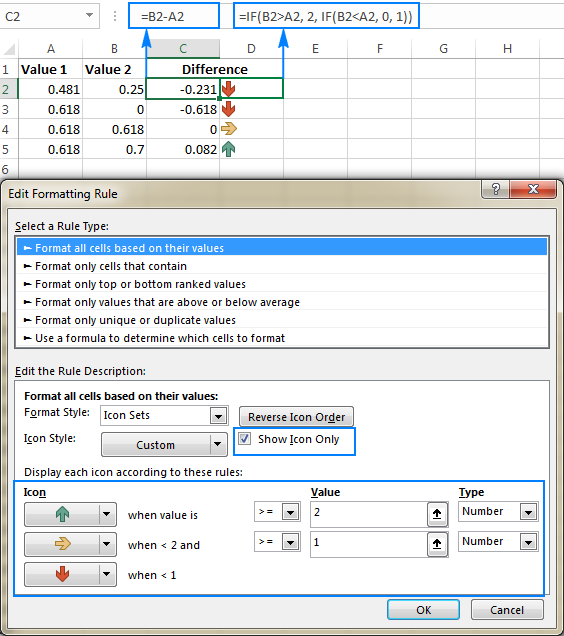 To compare more than 2 cells in a row, use the formulas discussed in the above examples in combination with the AND operator. The full details follow below. The AND formula returns TRUE if all of the cells contain the same value, FALSE if any value is different. 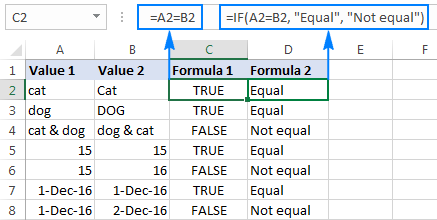 The IF formula outputs the labels that you type in it, "Equal" and "Not equal" in this example. The following examples show how you can verify that all cells in a given range contain the same text as in a sample cell. The number of cells containing the same value as in the sample cell (returned by the COUNTIF function). As shown the above screenshot, the formula perfectly copes with a range of text strings, but it can also be used to compare numbers and dates. If the character case makes a difference, you can compare strings to the sample text using the following array formulas. Sometimes you may want to check if the text strings in each row contain an equal number of characters. The formula for this task is very simple. First, you get the string length of two cells using the LEN function, and then compare the numbers. As demonstrated in the screenshot above, the formulas work for text strings as well as numbers. Tip. If two seemingly equal strings return different lengths, most likely the problem is in leading or trailing spaces in one or both cells. In this case, remove extra spaces using the TRIM function. The detailed explanation and formula examples can be found here: How to trim spaces in Excel. This is the last example in our Excel Compare Strings tutorial, and it shows a solution for a rather specific task. Supposing, you have 2 columns of text strings that contain a character important to you. Your goal is to check whether two cells in each row contain the same number of occurrences of a given character. To make things clearer, consider the following example. Let's say, you have two lists of orders shipped (column B) and received (column C). Each row contains orders for a specific item, whose unique identifier is included in all order IDs and is listed in the same row in column A (please see the screenshot below). You want to make sure that each row contains an equal number of shipped and received items with that specific ID. To solve this problem, write a formula with the following logic. Lastly, you compare these 2 numbers by placing the equality sign (=) in between the above parts. The character to be counted (unique identifier) can appear anywhere in a text string. The strings contain a variable number of characters and different separators such as semicolon, comma or space. This is how you compare strings in Excel. To have a closer look at the formulas discussed in this tutorial, you are welcome to download Excel Compare Strings Worksheet. I thank you for reading and hope to see you on our blog next week. 19 Responses to "How to compare two cells in Excel (string comparison)"
This site is great. I was wondering if you could start posting some blogs about VBA coding and automating standard work tasks to save time. Your posts are awesome and explanatory enough that even a novice can understand typical formulas. first of all, its highly appciable what you are doing for a newcomer in excel like me. i read all of your post but couldn't find what i am looking for so here I am giving details of my query and hope you will reply as you get time. Is it possible to use formulae to compare the two column and based on the column A shows the diffrence with color higlight and symbol of up and down. I have columns of information as follows. I want P:U to look as below. I have more than two thousand rows like this. I am trying to make a daily working record for our project. I need to have four column "time-in"; "time-out", "Total hours worked", "Overtime calculation". I can't seem to format the time-in , time-out cell to format such an 1.30am. For though I am selecting the option; when I enter the time after formatting the cells it shows the following format 1/8/1900 12:00:00 AM. By the way I am using MS Office 2016. I wanted to give marks in a question according to the following scheme. It's a multiple choice problem with more than one option possible. There are 4 options. If a student gets it completely correct, he/she gets 4 marks. If he/she gets it partially correct, then marks are given according to the number of options which are correct for the student. But if even one option given is wrong, then -2 marks are awarded. How can we do its programming in excel? Hi Svetlana, I have data in three columns in the pivot. Please see row 4 and 5, they are the same record but because of comma it is showing up in two different lines, is there is any fast way to clean such data? I'm looking for comparision of two cells by ignoring return chars. For ex. when we compare below 2 values, it should return true. If B2 is than or = to 100% of D2 I want the color to be green. For the life of me and much time I can't figure this conditional format out. The training lesson is very useful. great help indeed. Thank you for putting up such wonderful lessons. Cell A1 has word "daily"
Cell B1 has word "day"
So if X=2, means it will compare if at least 2 same letters in sequence appear in both cells of the same line. In this case answer is yes because "daily" in cell A1 has the letters "da" and "day" in cell B1 also has the letters "da". But in this same case if we program X=3, then it will come as No Equal 3 letters in a sequence, because "dai" is different than "day". If you could help which formula to use would be greatly appreciate. I'm afraid there's no easy way to solve your task with a formula. Using a VBA macro would be the best option here. However, since we do not cover the programming area (VBA-related questions), I can advice you to try and look for the solution in VBA sections on mrexcel.com or excelforum.com. Sorry I can't assist you better. I would like to ask if there is a formula or way we can count the number of words in a text in a cell and compare it to another cell and check if what words does not match. I hope you read this comment and answer. Thanks you! !